How to import to India from Argentina? What are the procedures for registration, import certification, import customs clearance etc to import to India from Argentina? How to import from Argentina to India? Let us discuss here about the process of importing to India from Argentina. You may discuss about how to import to India from Argentina at the end of this post at discussion forum. India’s trade in 2016-17 with Argentina is 512 million $ of exports, 2,500 million $ of imports and thus 3,012 million $ of total trade had done between two. India’s Imports from Argentina include sunflower oil, leather, soybean oil, petroleum, copper, wool and ferroalloys etc. 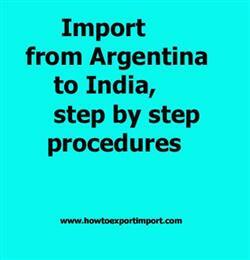 This piece of information explains on how to import to India from Argentina. You may add below your views on importation of goods from Argentina to India. Information to import from ROSARIO to Gangtok. Step by step process to import from SAN PEDRO to Gurgaon. Methods to import from ROSARIO to Goa. How to import from BLANKA to Dimapur? Formalities for import from BAHIA to DelhiExplain to import from MENDOZA to Faizabad. Guidelines to import from SAN PEDRO to Gaya .Please guide to import from Resistencia to Guwahati. import Help to from Río Gallegos to Hyderabad. . Procedures to import from BUENOS AIRES to Dehradun. Need to import from CORDOBA to Dholera. Muthaiyan: On 19 July 2018 Dear sir I want details to fresh blueberry import to India.